Here we are again with the summer issue of 'Hyakunin Issho'. During the time I've been writing this, it's been pouring with rain outside, but by the time I finish getting it all laid out, printed, and mailed to you, it'll probably be hot summer. Just as I was turning fifteen years old, a few months into my first year of high school, our family moved yet again. This was a bit different from most of the previous moves in a couple of ways. My father was leaving the steady employment with the military bands to strike out on his own as a free-lance musician, a very big step, and we were also leaving the prairies, where we had spent the past ten years, for the west coast, Vancouver. This particular move turned out to have a major impact on my life. When I went to the local high school to register for classes, I had a meeting with one of the teachers to try and decide what courses to take (the school year had already been under way for a couple of months). After filling in the courses required for my particular 'stream' (potential university entrance), there was one blank slot left. The teacher noticed on my papers that my father was a musician. "Why don't you take band class? Do you play an instrument?" There does sometimes seem to be a proper time and place for things in our lives. 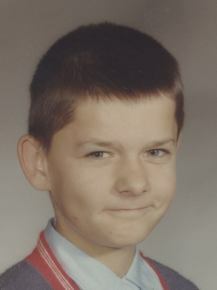 Back in grade 7 - music raised no 'spark' in me at all. This time in grade 10 - an 'explosion'. I became fanatically interested in flute playing, to the exclusion of just about everything else. I was years behind the other music students, most of whom had started in middle school. When I sat with the band that first week, I couldn't even follow the printed music with my eyes, it went by so quickly, but after just a few months I was as good as anybody in the group. When you ask people living in other countries to tell you what they know about Japan, you will hear various words time and again - Mt. Fuji, cherry blossoms, SONY, kimono, etc. etc. Each person's list will be different. But there is one word that will appear on nearly everybody's list: tatami. For westerners of course all 'know' that Japanese homes are all covered with 'wall to wall' tatami mats in every room. In any photo of a Japanese home appearing in a magazine, the floor is always covered with pristine golden tatami. So it was that last year, when Mr. Iwao Tsuburaya became a collector of my prints, I was doubly pleased. Of course pleased to have a new collector ... but also pleased because I would be able to learn more about tatami. You see, he is a tatami-ya-san, installing fresh tatami in new houses, and replacing them later when they have become worn. Chatting with him about his work and activities, I was surprised to find that many of the things I 'knew' about tatami were misconceptions. I had assumed that tatami had been part of all Japanese homes since back in the Heian era, but he told me that they have actually only been available to 'common' people for little more than a century or so. And as for tatami being the standard unit size that I had thought, this is not the case at all, with four major sizes being recognized; from the largest in Kyoto, down through Tohoku and Kanto sizes, to the tiny 'danchi' size, many centimeters smaller. Or, as I should say, many 'sun' smaller, because of course just as in my own world of hanga, measurements are all expressed in those traditional units. I felt a bit saddened when he talked about how modern factories are able to turn out finished tatami so easily and quickly, but actually from his point of view, mechanization had simply taken away all the hardest drudgery from his job. 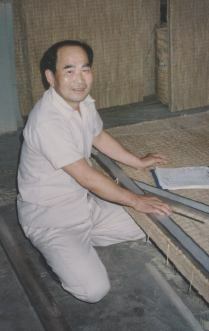 Compared to his younger days, when he had to sew by hand through the thick hard mats of straw, and could finish no more than one 6-mat room each day, he described his job now as 'raku', easy and relaxed. Tsuburaya-san, thank you very much for your contribution to my printmaking. From now on, I won't forget to include you in my list of support workers! It is the bench that immediately captures my attention as we step into the room. It is wide and low, made from hard, heavy keyaki wood, battered and scarred from decades of daily use, with the top surface deeply burnished by rubbing from the cloth that protects the back surface of the woodblocks. It stands in front of the window overlooking the garden, and the diffused light from today's over-cast sky falls softly over the half finished wood-block resting on its surface, throwing the carved lines into clear relief. A carving knife, the wood of the handle also polished by long use until it glows, lies on the bench next to the block where the carver has put it down to turn and greet us. The workbench, the woodblock, the knife ... they make up a picture the details of which have not changed in more than a hundred years, in far more than a hundred years. 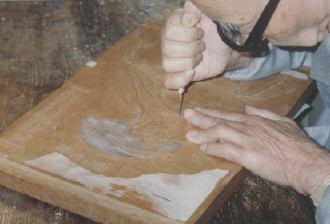 My friend Sadako and I have come to see this picture, and to hear some of the story to be told by Mr. Susumu Ito, master woodblock carver, working here at his home tucked away in the narrow back streets of Arakawa-ku, in Tokyo's shitamachi district. He has been living and working there in this house, here in this tiny 2-mat room, for more decades than I have been alive ... many more. For most of his 80-odd years, ever since first picking up the carving tools at age 12, he has sat in front of such a workbench, gripping the delicate knife in his right hand, almost burying it in his grip, and carving, carving, carving ... How many blocks have passed over the surface of this bench? How many prints has he made? It has never occured to him to try and answer that question. For Ito-san, this is simply his job, his daily work. Before leaving my home today to come to this place, I had spent some time studying a particular print I own, a reproduction of a famous Utamaro design. Had studied the delicate, almost invisible hair lines surrounding the face of the woman depicted, the flowing curves of the lines of the fabrics, the smooth sharp lines of the fan she is holding ... all these lines carved by Ito-san at this very bench some years ago. Carved with supreme confidence, and with a skill which I sometimes despair of ever reaching. 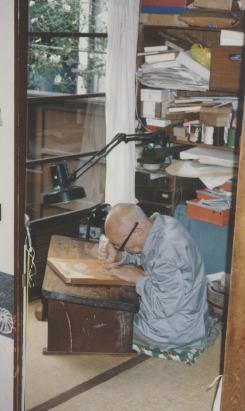 When, during our visit, I show Ito-san some of my own prints, and one of my carved blocks, I suddenly find that now, as I sit here next to him in this room, the work that I had thought was actually 'not too bad', somehow has come to look clumsy and amateurish. He looks them over - for quite a long time - and makes some very kind comments, but I have to wonder what he really thinks of all this; of this foreigner who is trying to follow such a path. But I am sure that Ito-san too, loves his work. He doesn't 'think' about it anywhere near as much as I do, and on a number of occasions during our conversation, he had to pause and think twice before responding to something I had asked, as he had never before considered such matters. 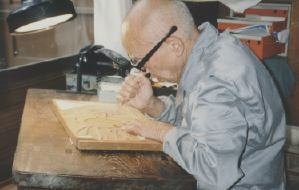 Woodcarving is not an intellectual pursuit for him, but simply a way of life. He eats, breathes ... and carves. My mother was visiting Japan a while ago, coming over from England to see her two grand-children. She was here for nearly a month, and almost every day, during the time that my daughters were in school, she went out for a long walk, tramping around our district. Of course, she can't speak any Japanese at all, but she doesn't let that stop her from seeing everything she can, and meeting as many people as possible. For her, the contrast between Japan and England is nothing short of astonishing. In her eyes, Japan is currently in a kind of golden age, just as England was about forty years ago, when I was a very young child. The streets are safe and clean, everybody is busy working, people all seem willing to help each other, education standards are high, public transportation is magnificent, and there is a general feeling of successful accomplishment in the air. She contrasts this with the England of the present, where she says that none of these things are true. Over the past fifty years or so, the people living on these islands have done an extraordinary thing: they have created from the rubble of a war-ravaged country, a society that offers each of its members almost complete freedom to seek his own path to happiness, in return asking only that each person also keep in mind that it is a 'two-way' street, and that there are responsibilities to accompany such freedoms. I am hard pressed to think of anywhere in the world where the balance between responsibility and freedom is so successfully managed as today's Japan. It's a source of great sadness to me that most Japanese people do not realize what a 'heaven' it is that they have built, and in which they live. But I do ... Thank you everybody, for being willing to share it with me! ... and with my mother! In the Autumn issue of 'Hyaku-nin Issho' last year, I mentioned that I had been doing some writing for the 'Mainichi Weekly' newspaper, having been asked to contribute short essays for their front page. I've been having fun doing that, and this spring, got a chance to do more for them. They asked me if I would be interested in doing a weekly column, and of course I accepted immediately. But promise not to laugh when you see my pictures!